Let's go back in time to 1983. This was when gaming was still in its infancy, and graphics were pretty simplistic. A new arcade cabinet enters the arena, known as Dragon's Lair. This game brought fully animated cutscenes done by the legendary Don Bluth and reflex-based gameplay. It was punishingly difficult, but unlike anything else that had ever come out until that point. Come back to now, and we have Dragon's Lair Trilogy. This remastered collection combines the original, the sequel, and Space Ace into one package. Should you check out this package of gaming nostalgia? Read on to find out! As the name suggests, Dragon's Lair Trilogy includes 3 separate games in the package. While this collection was released on other systems in the past, the PS4 version is the definitive collection. Dragon's Lair was the one I played the most when I was younger. A friend of mine had a laser disc player and his dad let us play Dragon's Lair when we were kids. It was one of those games that took a lot of trial and error, but we loved it. I even got to play the game in an arcade cabinet when we visited Disney Quest's arcade. The sequel brings even more bombastic set pieces and ups the intensity significantly. Finally, Space Ace takes the style of animation and gameplay to a sci-fi setting but keeps the same concept intact. There is minimal voice acting and some music to accompany each scene, but the main draw here is the visuals. The classic animation looks great in HD on the PS4 and nostalgia ran strong through my veins as I played it. Beyond the games themselves, there are also some great special features included in this collection. Fans of the series and those curious about gaming history will find original trailers, commercials, and interviews to watch. For those who are curious about the animation, some detailed drawing tutorials show you exactly how the characters and scenes are created. It's all very fascinating for someone who enjoys behind-the-scenes gaming material. For those who are fans of the originals, this is the definitive collection. Let's find out how the gameplay holds up. The gameplay in Dragon's Lair Trilogy can be seen as the origins quick time events that we know all too well in today's world. 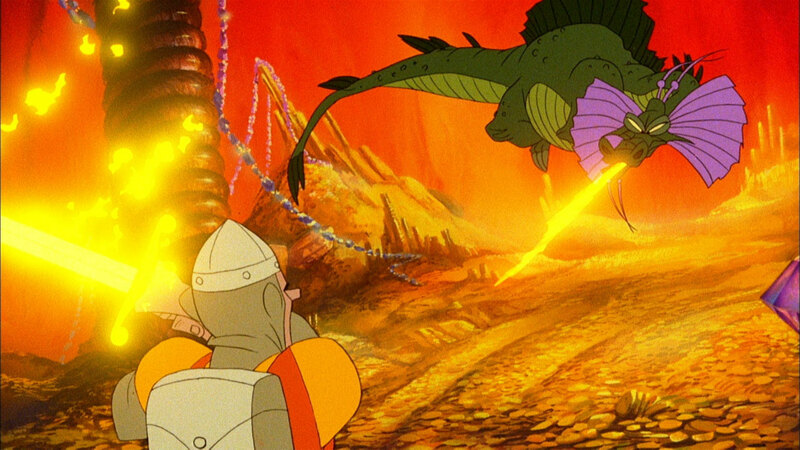 Developers like Telltale owe their entire engine concept to Dragon's Lair, illustrating the importance of these games. In the original releases, players had to react within seconds to various scenarios. You could move in a direction or use your sword, but if you messed up, you lost a life. Getting to the end was a massive achievement. It required a lot of trial and error or some serious god-like reflexes. Thankfully, Dragon's Lair Trilogy offers plenty of options for making the experience less punishing. You can choose how many lives you have, turn on indicators to show what your input should be, and enable longer response times. Other options remove some of the more difficult scenes, and you can even watch the entire game if you prefer. Both purists and casual newcomers will be satisfied with the options here. Personally, I think this is great as it enables a new generation of gamers to check out one of the classics, regardless of their skill level. The exquisite hand-drawn animation from the original releases looks great in HD on the PS4. There's some slight graininess to it, but otherwise, the remaster brings the original animation to the modern day in superb fashion. Sound effects and some voice acting are still intact. The main character mostly grunts, yells or screams, but it adds to the humor. Later games in the trilogy offer more voice acting, all of which is suitably fine and sounds good in the remaster. There's a slight jarring between scene transitions and inputs, but this was how the original release ran to the best of my knowledge, and it's not distracting or detrimental to the gameplay. Music is very minor, but it adds tone and tension to the scenes just fine. As someone who played the original, I absolutely recommend Dragon's Lair Trilogy to anyone looking to experience it again. If you're a newcomer, keep in mind that these are short, 20-minute games that have a lot of replay value for score hunters and difficulty enthusiasts. The special features also add some great insight into the making of this classic series. There's enough here to keep you busy for a little while, and the extras are a nice touch. Ultimately it's a gaming classic, a piece of history, and well worth your time.